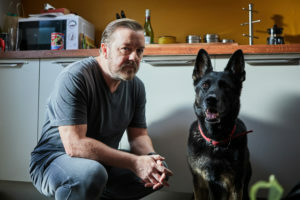 Ricky Gervais will be appearing on After Life, a new Netflix series about a widower who decides to take a new approach to life after his wife’s death and who embarks on some new and fascinating adventures. Netflix has just released promotional images for the show as well as the release date of the six-part series. After Life is created, written and directed by Ricky Gervais (The Office, Derek). Charlie Hanson is producer and Ricky Gervais and Duncan Hayes are executive producers. This will be Gervais’ return to the small screen after Derek and various guest appearances on specials. “Tony (Ricky Gervais) had a perfect life. But after his wife Lisa dies, Tony changes. After contemplating taking his own life, he decides instead to live long enough to punish the world by saying and doing whatever he likes from now on. He thinks it’s like a Super Power — not caring about himself or anyone else — but it turns out to be tricky when everyone is trying to save the nice guy they used to know. After Life will launch globally on Netflix on March 8.